YOLANDA EZELL sure knows how to pack a punch - both literally and figuratively. Straight up, there just aren't any entertainers like her around. Talk about diverse interest ... acting, mentoring children, running a nonprofit foundation, singing, or writing a soon - to - be published book, Yolanda does them all well. She is passionate about sharing her experience and talents with others - often donating time and a portion of her profits to do so. 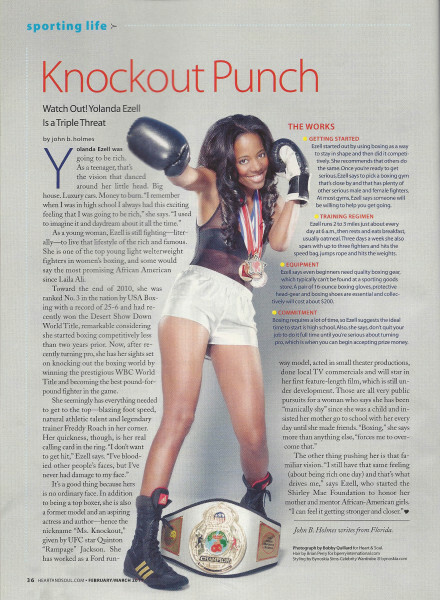 With an impressive resume of past career achievements -- successful Ford runway model and beauty contest winner, and former, Assistant Vice President at on of the nation's leading Investment firms to name two -- she has now taken on the challenge of being one of woman's boxing's newest sensations.